Today’s competitive workplace demands that managers evaluate employee performance, and provide coaching. 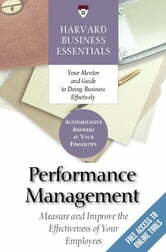 Performance Management will help managers prepare for a formal performance meeting with a direct report, and create a development plan to increase employee productivity. The Harvard Business Essentials series is designed to provide comprehensive advice, personal coaching, background information, and guidance on the most relevant topics in business. Whether you are a new manager seeking to expand your skills or a seasoned professional looking to broaden your knowledge base, these solution-oriented books put reliable answers at your fingertips.